Abstract. Global temperature is a fundamental climate metric highly correlated with sea level, which implies that keeping shorelines near their present location requires keeping global temperature within or close to its preindustrial Holocene range. However, global temperature excluding short-term variability now exceeds +1°C relative to the 1880–1920 mean and annual 2016 global temperature was almost +1.3°C. We show that global temperature has risen well out of the Holocene range and Earth is now as warm as it was during the prior (Eemian) interglacial period, when sea level reached 6–9m higher than today. Further, Earth is out of energy balance with present atmospheric composition, implying that more warming is in the pipeline, and we show that the growth rate of greenhouse gas climate forcing has accelerated markedly in the past decade. The rapidity of ice sheet and sea level response to global temperature is difficult to predict, but is dependent on the magnitude of warming. 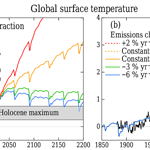 Targets for limiting global warming thus, at minimum, should aim to avoid leaving global temperature at Eemian or higher levels for centuries. Such targets now require negative emissions , i.e., extraction of CO2 from the air. If phasedown of fossil fuel emissions begins soon, improved agricultural and forestry practices, including reforestation and steps to improve soil fertility and increase its carbon content, may provide much of the necessary CO2 extraction. In that case, the magnitude and duration of global temperature excursion above the natural range of the current interglacial (Holocene) could be limited and irreversible climate impacts could be minimized. In contrast, continued high fossil fuel emissions today place a burden on young people to undertake massive technological CO2 extraction if they are to limit climate change and its consequences. Proposed methods of extraction such as bioenergy with carbon capture and storage (BECCS) or air capture of CO2 have minimal estimated costs of USD89–535 trillion this century and also have large risks and uncertain feasibility. Continued high fossil fuel emissions unarguably sentences young people to either a massive, implausible cleanup or growing deleterious climate impacts or both. How to cite: Hansen, J., Sato, M., Kharecha, P., von Schuckmann, K., Beerling, D. J., Cao, J., Marcott, S., Masson-Delmotte, V., Prather, M. J., Rohling, E. J., Shakun, J., Smith, P., Lacis, A., Russell, G., and Ruedy, R.: Young people's burden: requirement of negative CO2 emissions, Earth Syst. Dynam., 8, 577-616, https://doi.org/10.5194/esd-8-577-2017, 2017.